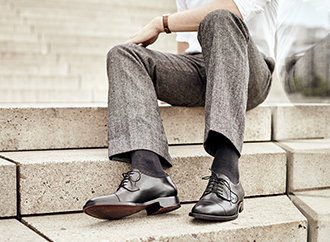 Heinrich Dinkelacker shoes are primarily available from selected retailers and our online shop. Visit our factory shop at our main location to enjoy a special experience. Our store in Bietigheim-Bissingen features the largest selection of our footwear, suitable shoe care products, one-of-a-kind samples and selected factory seconds that are available here – and nowhere else – at wonderful bargains. The Heinrich Dinkelacker store is a special location when it comes to our range. Located at our current company headquarters in Bietigheim-Bissingen, this shop is fully stocked with sophisticated accessories and premium shoe care items made by renowned brands. Our flagship store is also the only location where you can see the entire Dinkelacker shoe collection in person and dive into the thrilling world of luxurious footwear. The Heinrich Dinkelacker store also boasts another special feature: our showroom and sophisticated outlet include discontinued models (which we sadly has to part from over the course of expanding our collection) as well as one-of-a-kind samples — truly unique pieces. We also offer an exclusive selection of our factory seconds. These are shoes with small defects that you can acquire at reduced prices. Our professional sales team would be happy to take the time to advise you, and can answer any questions you may have regarding finding the perfect fit, correctly caring for your shoes and stylishly combining your footwear with other pieces in your wardrobe. You can also commission necessary repairs to your Dinkelacker shoes in our store, or take advantage of a custom shoe consultation. We look forward to greeting you in Bietigheim!